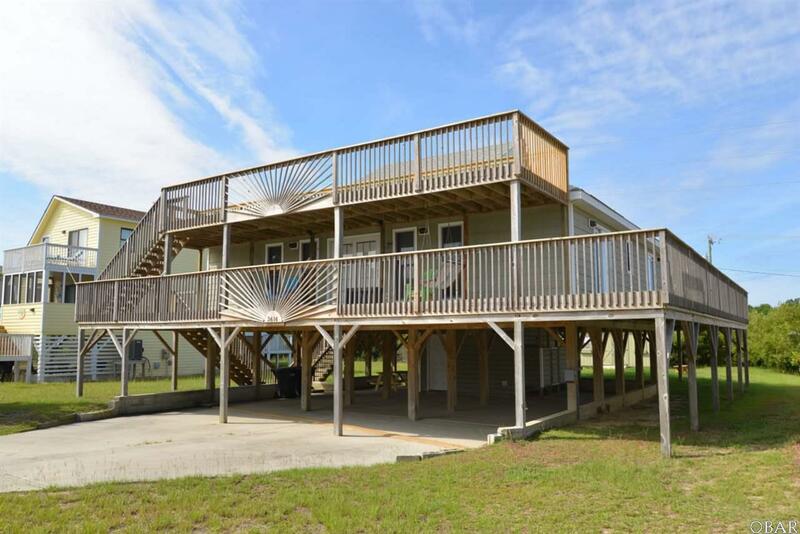 REMARKABLE TURN KEY BEACH HOME - READY for RENTERS or for YOU to personally enjoy!!! Spacious 4 bedroom, 2 bath Single Family Home in-between the highways in Kitty Hawk with Ocean views & Quick walk to the beach - Open & Airy H-Floor Plan with 360° Wrap around Deck - Updated this Year Inside & Out - NEW Paint - NEW "Karndean" Flooring throughout entire home including Bathrooms - NEW Fixtures - NEW Top-of-the Line Furnishings & Designer Bedding - NEW 40" Smart TV in Living area & 28" Smart TV's in bedrooms - NEW Toilets - NEW 80 gallon Hot Water Heater with wifi control - NEW wifi control for Heat/Air -maintenance for the HVAC has been paid in full for the upcoming year through August 14, 2017 - NEW Septic System & Lines in 2014 - NEW Roof Exhaust Vent - NEW Outdoor Outlets - NEW Upper Deck support beams to code - NEW Outdoor Solar Deck Lighting - NEW Countertop for Laundry Area - Kitchen Appliances are 4 years old - All Bedrooms have a Slider Door that goes out to the Wrap around Deck - Pella Windows & Doors throughout - Double Sinks & Tub/Showers in Bathrooms - All Quest Plumbing was replaced with Pex - Large Top Front Deck with Ocean views - Designer Shingle Roof and Cedar Shake Vinyl Siding - Under Terminex Contract for the Year so there are no Creepy Crawlies here - Large Shed in Back Yard for your beach toys - Sizable Concrete Carport - Outside shower with dressing area - Short 3 Min walk to the Beach down Tateway Road or Drive to the reserved neighborhood Parking at the corner of White and Poseidon across the street from the Beach - Relocate the shed to make room for a pool or add a Jacuzzi - First year in rental program and 12 weeks are on the books - http://www.joelambjr.com/booking/pelicans-landing/068 - GREAT rental feedback from this first year with repeat renters for 2017. 2016 Kilmarlic Golf Club membership http://www.kilmarlicgolfclub.com/overview.html - This home has it ALL - ONE of a KIND - MUST SEE!